Verdict: HP LaserJet Pro 400 M451dn (CE957A) is the new color Printer that results in superb output even photos with great speed. This brilliant printer can be placed anywhere at home or work with utter convenience and style. Verdict: The £378 HP LaserJet Pro 400 M451dn colour laser printer produces extremely nice output - including photos - and is very speedy for a model in this price range. It also has an automatic duplexer, a feature missing from the HP LaserJet Pro 400 Color M451nw that we recently reviewed. Verdict: Sorry to see that this printer has been discontinued. Got it for about $200 back in 2015. Has exceeded all expectations. Prints are excellent. No jams. No complaints at all. The cartridges that came with the printer amazingly lasted about 18 months. Actually, I do have one complaint. Verdict: It's a fast reliable printer. Now that HP has fixed their terrible printer software installation packages the IT community can finally recommend HP printers again. Verdict: I own and operate a small invitation business and outsource MOST of my printing to large commercial print companies but I wanted something in house to small runs for things like dinner menus or place cards. Verdict: We bought this to replace the same 3-year-old model, which had almost 200,000 prints. It's a solid little workhorse. One negative for us: the toner costs. We use this in an educational environment, and (even though we used greyscale as the default) we ran around $3-4,000 per year in toner. DO NOT BUY!!! Jams a lot.... FRUSTRATED!!!! Verdict: We've only had it two weeks but we've been very happy with it so far. The toners are affordable though I wish that more than just the black toner came in high yield. Also wish that it could print full bleed but we are so happy with it otherwise we don't care about that. Verdict: Nice machine to have chosen as a replacement to my HP 2605dn. The quality of print stands up to my expectations. The rapid delivery also helped, since my other machine croaked one day and I wanted a near immediate replacement. Verdict: Does it do its job? The main points are: are the prints high quality? Is it fast enough? Is it reliable? The print is all three. Then is it affordable. The cost of the printer itself is okay, but per- cost is relatively high since toner is expensive. Other things are good. Verdict: I did not have a problem with the install on this printer as I had read others have. I did have to use the installation disc though. 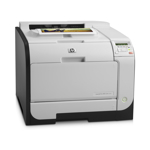 What I like about this printer is that it is smaller than my last HP color LaserJet. The ink cartridges are smaller too. It prints out fast copies.